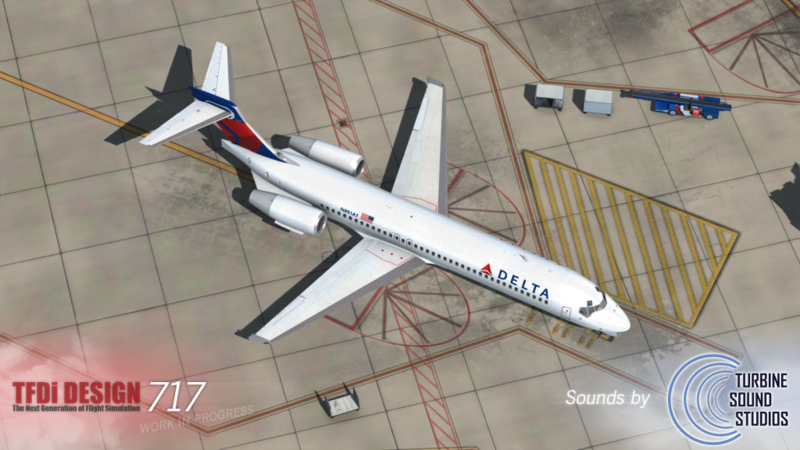 It’s been awhile since our last major update on the 717, but we’re back with some exciting progress. First and foremost, we’ve officially announced our cooperation with Turbine Sound Studios for the internal/external sounds. The 717 will ship with their soundpack specially fitted into our aircraft (at no additional charge to the customer, of course). This, paired with our realistic cockpit ambience and mechanical sounds (fans, avionics, switches/handles, etc.) will be quite an experience. Note: the cockpit sounds heard in our last video (“717 Flight Controls Overview”) are not final and may be improved as development continues. We’ve gotten the majority of its function and visual effects complete. 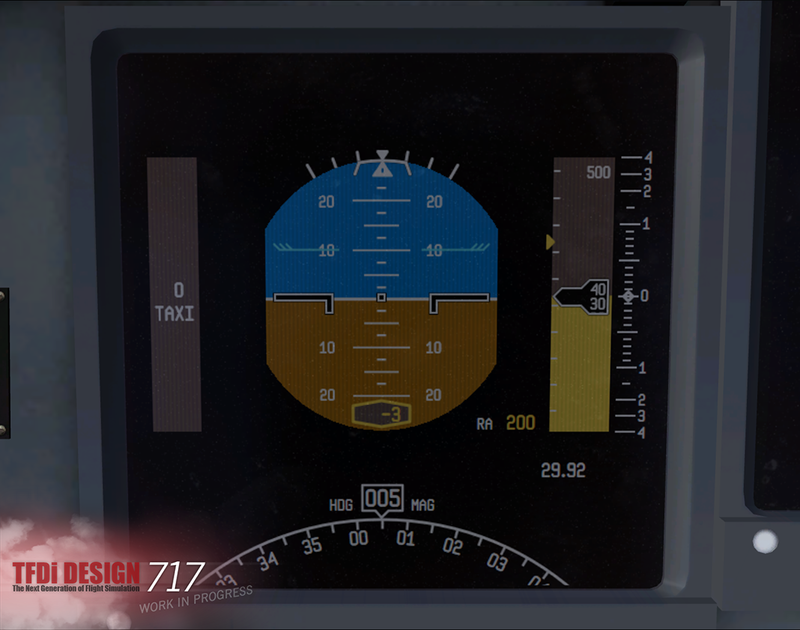 The captain’s and copilot’s displays are completely independent – including separate minimums callouts, giving us a very robust foundation for the more complex display options. The next major step, display-wise, will be implementing the navigation displays (activating the last currently inoperable main displays). 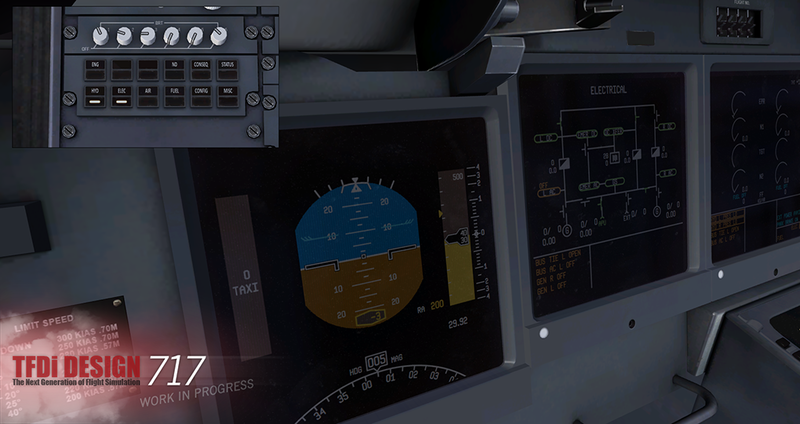 One of the most complex pieces of the 717’s EIS is the alert system – it displays logically arranged messages on the engine and alert display (EAD) and the respective system display (SD). 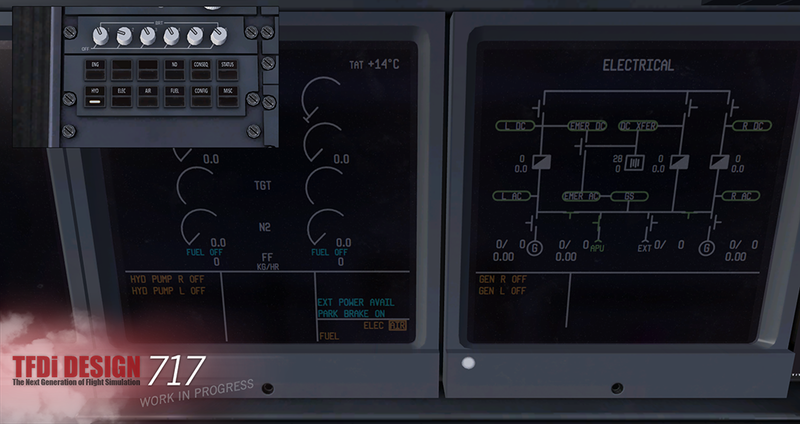 Here’s a screenshot showing this – in the first screenshot, the aircraft is running properly on APU power with all transfer buses automatic. As well, you can see that the “ELEC” cue switch has become illuminated on the pedestal. Pressing this switch, as this point, will acknowledge the new electrical warning messages and move them entirely to the electrical SD and extinguish the light. The other new system we’ve implemented is the automatic switching of displays. When a display unit is turned off (or is off due to insufficient power), the system will reconfigure which displays appear on which physical screen. This can be seen in the following screenshot set. In the first shot, all displays are turned on. In the next shot, I’ve turned off display units 4 and 5, causing the system to move the SD to display unit 2, instead of 4. I won’t be including any new cockpit screenshots here, as we’re not quite ready to show it off yet. That said, Brandon Filer (our resident graphic/texture guru), has been hard at work crafting some considerable visual refinements for the cockpit. It is very likely that our next major post will be chock full of nice new things to see. We’re moving closer to considerable project milestones and have also been slowly preparing our internal infrastructure for the inevitable testing period over the last few months. Of course, we don’t give release estimates until they’re sure enough for us to bet on, but we are moving along quite a lot, especially in some areas you can’t see just yet (FMS/AFS, etc.). That’s all for now and we’re looking forward to bringing this aircraft into the sky.